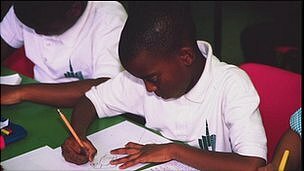 Black schoolboys can choose to perform poorly to avoid undermining their masculinity, the head of the Jamaican Teachers’ Association has said. Adolph Cameron said that in Jamaica, where homophobia was a big issue, school success was often seen as feminine or “gay”. He was concerned the same cultural attitude was affecting African-Caribbean male students in the UK. They are one of England’s worst-performing ethnic groups in schools. Only traveller children do worse at GCSEs. Although improvements have been made, last year just 40% of African-Caribbean boys achieved five good GCSEs including English and maths compared with the national average of 58.5%. Mr Cameron, head of the Jamaica Teachers’ Association, made the comments in a lecture at an event in Bristol aimed at promoting the educational achievement of black boys and sponsored by the National Union of Teachers. He noted that in Jamaica boys were at least 10 percentage points behind girls in national tests. Misplaced views about masculinity needed to be tackled in schools. He went on to ask whether the notion of “academic achievement” could co-exist with notions about “black masculinity” in contemporary culture. In an interview with the BBC News website, Mr Cameron said: “That notion of masculinity says that if as a male you aspire to perform highly it means you are feminine, even to the extent of saying you are gay. He said research had suggested that boys in Jamaica deliberately underperformed in literacy tests because the tests were carried out in standard English, and “to speak in standard English is considered a woman’s activity”. He went on to suggest the same cultural attitudes affected the learning of African-Caribbean boys in England. He continued: “I would not be surprised if here in England the same or similar things occur in terms of how they feel about themselves and how they respond to and with respect to the society around them. “Boys are more interested in hustling, which is a quick way of making a living, rather than making the commitment to study. This is a supposed to be a street thing which is a male thing. “The influence of this attitude towards masculinity seems to be having a tremendous impact on how well African-Caribbean and Jamaican males do. Mr Cameron said the issue needed further investigation but there was a growing realisation among teachers in Jamaica that they needed to tackle it in schools. Christine Blower, general secretary of the NUT, said: “There are obviously issues for black boys both in Jamaica and the UK. We need system-wide reform to ensure that the system does not disadvantage black boys.